It’s the Black and Blue List … for the bad guys! It’s hard to be an extra-super, over level 9000 secret agent and do your job properly when a double-extra-super-evil omniscient organization with government ties keeps getting in the way by trying to have you eliminated. But it’s just a day in the life of Scot Harvath, counterterrorism agent and all around swell guy. 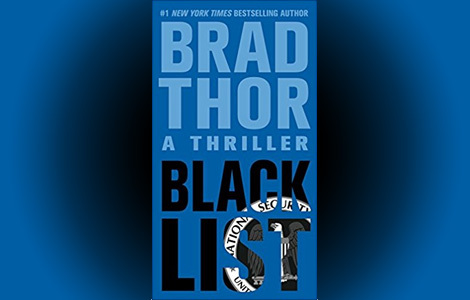 I make fun, but Black List is pretty good and, even better, author Brad Thor actually has something to say (I’ll get to that). Black List takes off immediately where Full Black left off. No need to worry, you don’t have to read Full Black if you don’t want to. (But why wouldn’t you want to? Seriously, Simon and Schuster want to know.) The two stories are unrelated. On the other hand, like all long series, knowledge of people and events from previous books helps. While I did read Full Black, I didn’t have the working knowledge of the rest of the Harvath universe, but it didn’t hinder my enjoyment of this book. In Black List, our hero, Scot Harvath, finds himself in the cross-hairs of a team of assassins. Several teams, as luck would have it. Not lucky for Harvath, of course, but lucky for you, the reader, because action sequences will follow. Unfortunately, Harvath has no idea who is targeting him or, more importantly, how. He’s alone in Europe, running for his life, and communications with his outfit are offline, leading Harvath to believe that he isn’t the only target. Naturally, he’s right (over 9000, remember?). Brad Thor is a fine thriller writer. It’s easy to blow this book in a night or two because the story never relents and the prose feels effortless. It’s not all guns and violence, but there aren’t many wasted pages. His action is economical and easy to follow. Characters are consistent. Scenarios are plausible within the framework of his world. I like thrillers and I plan on reading more of these novels. What’s wrong with a little moral dilemma? I’m all for a little patriotism and the good guys doing what needs to be done, but some rationalizations for violence and killing came across as finding a quick excuse to move the action along. What’s with the information dumps? The author relies on them in a number of places even though, in my opinion, he doesn’t need them. There are several supporting characters, mostly bad guys, who get a chapter full of a back-story that deadens pace of the storytelling and doesn’t offer anything beyond, “No, see, he’s bad because his parents were mean to him.” If the parents had something to do with the story, great. But they don’t. If the character’s actions must be explained beyond what’s happening right now, why not make it come up in conversation? Make some drama out of it instead of a dull therapy session. Finally, I mentioned that the author has something to say. In Black List, he tackles the perils of our digital world, where everything and everyone is online. Other authors have taken this subject on, some better than others – if you prefer thrillers, Jeffery Deaver had a good one that revolves around a data-mining company. In light of the past decade of Wikileaks and Edward Snowden, Brad Thor chooses to go the national security route and the pitfall it presents with so much information available for abuse by those in power. The premise may seem far-fetched when you sit down and read it. But … is it?